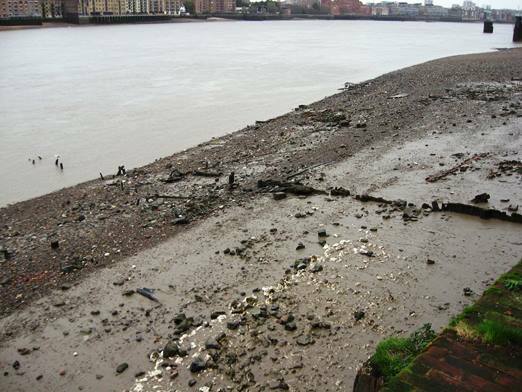 In February, the Bermondsey FROG went on a monitoring visit to the Rotherhithe foreshore. We were very lucky with the weather, which was sunny and not all that cold. This makes a great deal of difference to our monitoring – if it’s cold and wet, it’s very tempting not to linger over any puzzling features! There seem to be plenty of these in Rotherhithe. 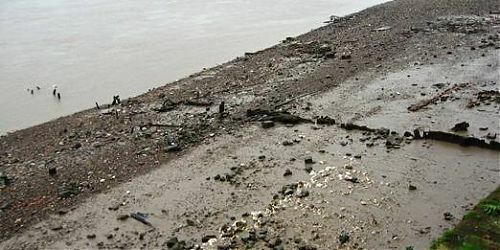 The features list is based on the Thames Archaeological Survey done in the 1990s, with the addition of features we have seen and added more recently. Some things, like the stairs, the gas jetty, and the series of bargebeds near the Mayflower, are reliable fixtures. Others, like various consolidations and artifact scatters, are much more difficult to be sure about, and may have been washed away. An interesting anchor, which we noticed last year, has been appropriated and now decorates the houseboat next to the stairs! 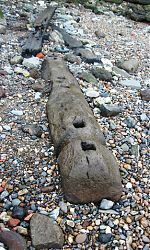 Then erosion reveals new features, and sometimes happens so fast that we have difficulty recognizing some stretches of the foreshore, even after only a few months. The area below the Mayflower is currently being eroded exceptionally fast, and we saw two mooring features that we had no record of. 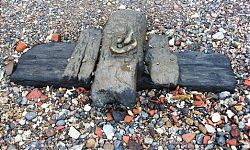 The timber feature that seems to be a boundary marker between Brandrams Wharf and the property next to it, is becoming clearer at each visit. We are counting the windlasses, and our total is now up to five, or possibly six! 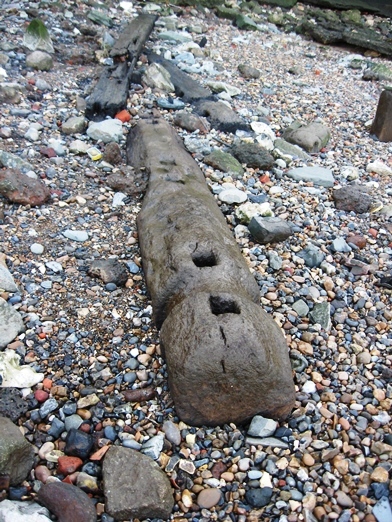 They are reused either as mooring posts or just to consolidate the foreshore. My theory is that they are an awkward shape to be used for anything much else. It also looks as if there is a new bargebed revetment emerging just before you get to the next stairs. 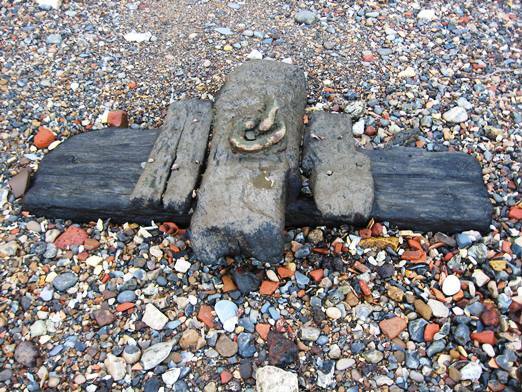 At this point we met one of the mudlarks, who showed us a tiny trade token he had just found, with the design of a millstone on it. And it was local, too! He said he records all his finds with the Portable Antiquities Scheme , which is well worth checking out, as you can search by find area as well as for specific types of item. Once we’d finished, it was off to a café for a well earned cup of tea! We have now decided that it makes an enormous difference to our records if we sit down straight away, go through the monitoring list, and make sure we agree what we’ve seen, and note down what we’ve taken photos of. Otherwise, as my daughter says when she looks at my camera, it’s all just mud, mud, mud.